ACDID133301 ACDMA865 ACDCA67148 ACDSEP ACDSP ACDTY9 ACDGC PeSAMember. 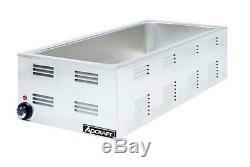 Adcraft Countertop 1500W Food Warmer W/ 4 - 3rd Pan Capacity - FW-1500W. We carry a wide range of AdCraft products. Low Price Guarantee On All Adcraft Products! This item is a QUICKSHIP item AdCraft 1500 Watt Countertop Food Warmer W/ 4 - 3rd Pan Capacity Model: FW-1500W This countertop food warmer is constructed from heavy duty stainless steel, has a 4 - 3rd pan capacity, and runs on 120 V current. Commercial quality heavy gauge stainless steel construction. Interior well constructed of 20 gauge 18/8 stainless steel. 27"L x 12"W opening. 6-1/2" deep well can accommodate pans up to 4" deep. 5' three prong grounded cord included. Unit dimensions: 29.5"L x 14.5"W x 8.5H. 120V, 1500W, 12.5 Amps. Other Related Items from ACityDiscount. ACityDiscount strives to create a positive experience for all our customers and welcomes your suggestions. We value our reputation and hope you will give us the opportunity to proactively address any concerns you may have. ACityDiscount may update these Terms and Conditions at any time. We will revise the iteration date at the bottom of this page to reflect the most recent update. We encourage you to frequently check this page for any changes. You accept responsibility for checking applicable state and local codes and for ensuring items meet those codes before purchasing. You will not hold ACityDiscount responsible for anything not stated in the listing or included in the picture, including, but not limited to, assumptions made by you or any verbal statements. You are responsible for filing any loss or damage claims in the manner and time frame directed by the carrier. Any reports of malfunction may require a detailed inspection report from a qualified technician. You agree to cooperate with problem identification and correction efforts. You agree to abide by ACityDiscount's decisions regarding problem resolution. Our showroom located at 6286 Dawson Blvd, Norcross, Georgia 30093. If you give us notice, your order will be pulled to the warehouse loading dock and ready for loading when you arrive. Our warehouse staff will be happy to assist you loading your vehicle; however securing the load is your responsibility. Custom or manufactured-to-order items cannot be cancelled. Approval of return requests is at the sole discretion of ACityDiscount. Your account will be adjusted in the amount stated by ACityDiscount once all procedures have been followed. If you fail to follow these terms and conditions, there will be no credit. ACityDiscount's customer service and accounting staff will work hard to complete the process as quickly as possible. The item "Adcraft FW-1500W Countertop 1500W Food Warmer With 4 3rd Pan Capacity" is in sale since Monday, April 10, 2017. This item is in the category "Business & Industrial\Restaurant & Food Service\Commercial Kitchen Equipment\Storage & Handling Equipment\Heating & Holding Cabinets". The seller is "acitydiscount" and is located in Tampa, Florida. This item can be shipped to United States.